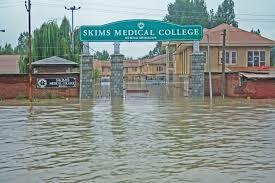 Patients heading to the SKIMS medical college in Kashmir are in for a shock with the hospital completely suspending its Casualty, OPD, IPD operations, due to an indefinite strike. As a result of a recent case of vandalisation where an employee of the hospital was accused of molesting a girl under anesthesia, the doctors and the staff are now on protest. As reported in a local newspaper in Kashmir, the doctors are of the opinion that the girl and her family have wrongly accused the employee as she was under sedation when the said technician was removing the ECG wires; she supposedly misunderstood his action. And, this further led to the girl’s family causing damage to the property estimated to be worth 50 lakh. “Costly hospital equipment for USG, X-Ray, ECHO, and also some equipments in Operation Theatres was damaged and rendered non-functional by the attackers. The fittings in theatre and emergency area were also broken,” they said. On Monday, the hospital wore a deserted look with OPD, Emergency, Gynecology and labour room and most other facilities locked up. Patients kept pouring in the hospital and were disappointed and underwent inconvenience as they were refused treatment.